When it comes to deciding what to have for dinner, pizza is usually a top choice. Whether you’re ordering delivery or traveling to Chicago to try the deep dish, who doesn’t love a good slice (okay, slices)? 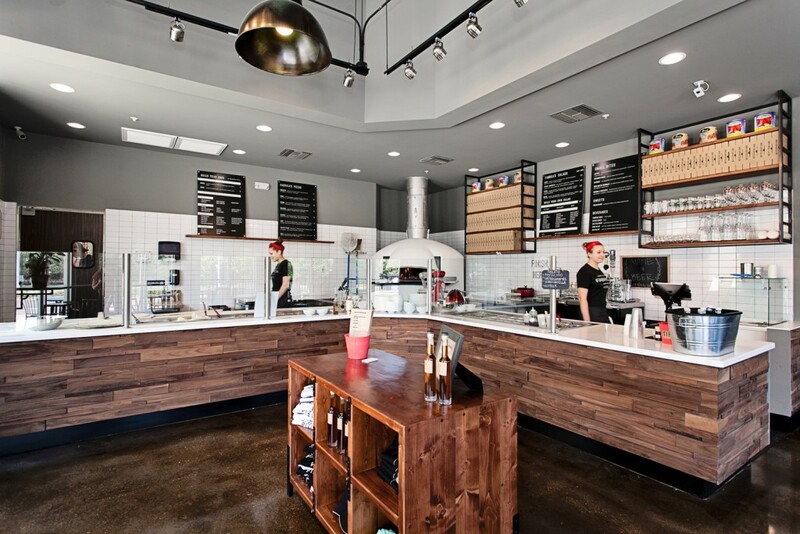 Hold off on booking your flight to Chicago and get rid of the pizza guy’s number on your fridge, because delicious, mouth-watering pizza does exist – right in Tampa at Fabrica Woodfired Pizza. On the corner across from Orange Theory Fitness (need they remind us how much we’ll need to work out after indulging?) near the Amalie Arena, Fabrica welcomes all that are smart enough to be joining them for dinner. As soon as you enter, the beautiful wood fire oven sits as workers swap out finished pizzas for newly crafted ones featuring all of the toppings you can imagine – from bacon, sausage, ham, grilled to chicken to veggies such as spinach, tomatoes, peppers, mushrooms and of course cheeses. Fabrica’s hand-stretched dough is made from 00 flour and the tomato sauce is made from fresh Marzano tomatoes. And what’s a traditional Neapolitan pizza without fresh mozzarella? And when it comes to selecting your ingredients, your options are endless. At first glance of the menu, I admit, I was having a hard time choosing just one pizza. But Fabrica already knows how to solve this problem. Their menu features a “Build Your Own” option, where you are literally able to build your pizza from scratch – from the sauces, cheeses, meats, and veggies. And to make things even better, you can build a half and half pizza. So if you’re unsure, or just want to try a little bit of everything (like me), you can build yourself two separate pizzas. Being a HUGE traditional pepperoni and cheese pizza fan, I just HAD to experience Fabrica’s version, which I can say did not disappoint. Each bite had the perfect amount of cheese and pepperoni and the crust was crispy, exactly the way I like to eat it. The second part of the pie featured grilled chicken (absolutely delicious! ), spinach, mushrooms, cheese and more pepperonis (they were THAT good). The entire build your own pie has 6 generous slices, which was PLENTY for me and my guest. As a side note, I did start off my meal with a small (also VERY generous for a small) spinach, feta, walnut and balsamic salad – which was super fresh and a perfect pallet cleanser for my main course. I also split this with a friend and we still couldn’t finish the entire thing. As overwhelmed as I was with all of the delicious menu items and smells that were coming out of the kitchen, once my eyes skimmed over the dessert options, my heart probably stopped for a second when coming across the listed item: Nutella Pizza. I’ll let you in on a secret – I don’t really like Nutella. But seeing this, I absolutely had to order it to see what it was all about. And there were no regrets (and nothing a next day gym session couldn’t fix) once I took my first bite. Just like all of the other portions I had received that night, this was definitely a pizza; six slices and all. The warm, melted Nutella topped with powdered sugar on top of a crisp bread sent my taste buds into shock. If you have already eaten dinner somewhere and need a place to try out a dessert, it’s worth stopping in. By the end of the meal, I was completely satisfied – and definitely got a box to take home all of my leftovers – which I enjoyed the next day. Not only was the food excellent, but the staff was incredible. They were all super accommodating and I was checked on multiple times throughout my meal, which always enhances the experience. As for the décor, this place took me to an industrial, chill pizza joint that has magnificent views outside of the windows I sat next to. There is outside seating available as well and a giant mural of a guy on a moped, accented to one wall. The atmosphere was perfect, with small wooden tables paired with metal-like industrial chairs (that were super comfy). I may not have been transported to a pizza place in Italy, but this definitely did the trick. To see Fabrica’s full menu, click here. All in all, Fabrica has become a staple for me when I’m in the Tampa area and am craving delicious pizza and a great atmosphere. And let’s be honest, I WILL be back for that Nutella pizza. Have you been to Fabrica? Let us know what your favorite menu item is in the comments below or tweet us at Dive In Tampa Bay.